India is a priority market under the International Education Strategy as well as the Global Markets Action Plan. A recent example of our commitment to furthering Canada-India relations was my trip to India, where I held a Strategic Dialogue with my Indian counterpart, from October 13 to 14, 2014. We greatly appreciate the work of the Canada India Education Council to develop and enrich further collaboration between our countries. I am pleased to extend my warmest greetings to all those attending ‘The Business of Education‘ dinner, hosted by the Canada India Education Council (CIEC). Education is one of the cornerstones of our society. It is through education that we transmit our values and ensure that our children grow up informed and inspired by the principles that we cherish. Canada and India share a commitment to education, as a fundamental way of achieving peace and prosperity for our citizens. Through organizations such as the CIEC, educators from both countries can work together to open avenues of cooperation, to the benefit of both our countries. Events such as this remind us that when many come together for a single cause, much can be accomplished. 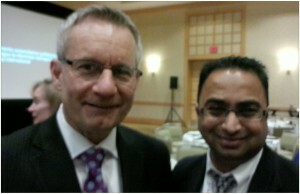 Prime Minister Harper said: “There is s tremendous amount of potential in our relationship with India. We share a history of cooperation in the Commonwealth and the United Nations, as well as a shared commitment to pluralism, democracy, human rights and the rule of law. 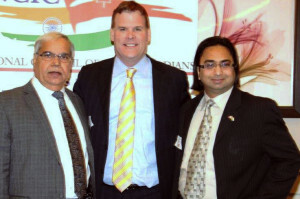 Our goal is to build a stronger, more dynamic partnership based on shared commercial, political and regional interests.” As Minister for Multiculturalism, I would like to thank the members of the Canada India Education Council for your ongoing work in support of cooperation between Canada and India in the field of education. 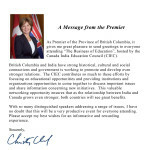 As Premier of the Province of British Columbia, it gives me great pleasure to send greetings to everyone attending “The Business of Education“, hosted by the CIEC. British Columbia & India have strong historical, cultural & social connections & government is working to promote & develop even stronger relations. The CIEC contributes so much to these efforts by focusing on educational opportunities & providing institutions & organizations opportunities to come together to discuss important issues & share information concerning new initiatives. This valuable networking opportunity ensures that as the relationship between India & Canada grows even stronger, both countries will see great benefits. With so many distinguished speakers addressing a range of issues, I have no doubt that this will be a very productive event for everyone attending. 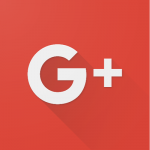 Please accept my best wishes for an informative & rewarding experience. I am pleased to extend my warmest greetings to those attending the launch of the Canada India Education Council and would like to commend the CIEC for their hard work and initiative. On behalf of Prime Minister Stephen Harper, I would like to thank you for your commitment and valuable contributions to a diverse and pluralistic society. 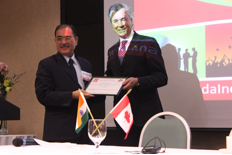 The CIEC’s efforts to promote educational ties between Canada and India will greatly benefit the students and organizations they represent from both countries. Education is essential to maintaining and strengthening our pluralistic society. As Prime Minister Harper stated: ‘Pluralism is the principle that binds our diverse people together. It is elemental to our civil society and economic strength. Thank you for your dedication to building and strengthening our pluralistic society and I wish you all the best for a successful launch. I first had contact with the Canada India Education Council (CIEC), less than one year ago. Based on a forty minute “cold call”, it became evident that if Fleming College wished to pursue a faculty recognized and supported professional development initiative in India, brokers, support and advice were required. Indeed, Fleming College received that and much more. In less than five months, not only has Fleming College gained membership to CIEC, we have just recently completed a faculty exchange with a ‘sister’ college in Mumbai. Now we are moving forward on the imaginative piece with the educational synergy that has taken place within the Canada/India corridor! CIEC on more than one occasion visited Fleming Campus to debrief outbound faculty, discuss logistics, assist in executing a tailor-planned international itinerary, as well as provide network coordinates to name just a few. Fleming College cannot begin to articulate the patience, assistance, time and enthusiasm that we have been so very fortunate to receive from CIEC. On a personal note, Mr. Neemuchwala and Dr. Sheila Embleton have opened up a whole new professional engagement network. Durham College engaged the services of Canada India Education Council (CIEC) to assist in the planning and coordination of a trip to India for the purpose of meeting with student recruitment agencies and agents in the following cities: New Delhi, Chandigarh, Ahmedabad, and Mumbai. The trip was well organized and was very productive for the College. The trip to India set the parameters in place that enabled the college to contract with an Indian company located in New Delhi to procure an office location for the College as well as employ a person who will act as the South Asia representative for Durham College throughout India.